One of the defining landmarks in Johannesburg, South Africa is the Coca-Cola dome: A 19,000-person arena sponsored by the beverage giant. 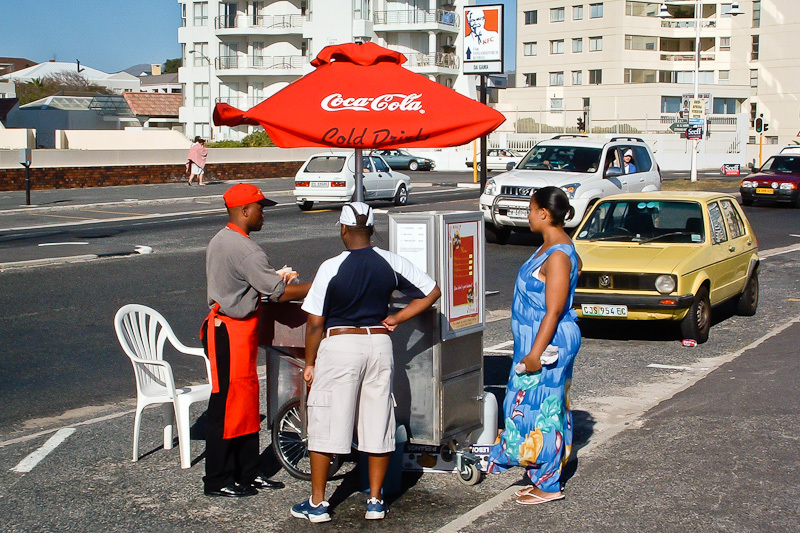 Coke has become increasing popular in South Africa, where an average of 254 Coke products were consumed in 2010. That’s more than the international annual average of 89 per person and quickly approaching the 403 Coke products consumed by the average American. KFC is also a significant presence in South Africa, with more than 600 locations in the country. Thanks to the increasing availability of soda and fast food, South Africans are developing the chronic diseases associated with the nutrient-poor standard American diet. As diets around the world are becoming less varied, and more dependent on processed convenience foods, few places demand the attention that South Africa does. As the home to strong historical inequalities and a fierce ongoing battle for racial justice the question arises: What is fueling the adoption of the Western-style diet there? Who is affected the most? In recent years, South Africans have been migrating from rural areas to urban centers in search of work. Along with more opportunity, life in an urban environment offers easy access to big supermarkets and fast food chains. While access to supermarkets can often be a good thing, large chains like Shoprite and Pick ‘n Pay carry mostly packaged foods that contain the processed meat, refined flour and sugar, and artificial preservatives, the very ingredients that are tied to diet-related illnesses in the developed world. Many of those who have recently migrated to urban centers consider their rural diets of unprocessed starches such as pap, high-fiber vegetables, and plant proteins “poverty foods,” and have come to embrace the fried fare and animal protein readily available in commercially dense environments. Meanwhile, steep food and fuel prices make food insecurity a persistent and pressing issue in South Africa. “Food insecurity” happens when nutritious food is not available or safe for consumption, and when households cannot acquire food in a socially acceptable way (i.e., scavenging, stealing, using emergency supplies, etc). From 1999 to 2008, access to healthy food has improved in the country’s rural and urban regions. However, the rate of food insecurity remains higher in rural areas: More than 33 percent in 2008 compared to about 20 percent in urban areas. The Development Bank of Southern Africa (DBSA) found that in 2008, 79 percent of households major cities Cape Town, Johannesburg, and Msunduzi, went without food because of a sharp rise in prices. The DBSA also found a direct link between poverty and food security; predictably, more money means better access to healthy, safe foods. While many South Africans go without adequate calories and nutrients, many also deal with a range of “Western,” chronic diseases associated with over-nutrition. The UN Food and Agriculture Organization (FAO) refers to this phenomenon as the “double burden of malnutrition.” It often occurs in developing countries whose markets have opened their doors to multinational food corporations and whose domestic public health efforts have been slow to combat hunger. Dr. Zandile Mchiza, senior scientist of the Medical Research Council of South Africa, has found that early childhood under-nutrition can lead to obesity later in life. This is cause for concern for low-income South Africans, many of whom probably did not get enough nutritious food when they were young. Obesity is a well-known risk factor for diabetes and 61 percent of South Africans are now considered obese. Black women have the highest rates of obesity, affecting about one third of the population. Among men, whites have the highest obesity rate, at 18 percent. About six percent of the South African population is diabetic, according to Dr. Larry Distiller, founder of the Centre for Diabetes and Endocrinology in Johannesburg. But, as Distiller told Health 24 recently, some in the nation are bracing for a “diabetes tsunami,” as The International Diabetes Federation estimates that the rate will nearly double by 2030. Cultural norms in South Africa often favor bigger bodies, especially among women. Thinness has come to be associated with the scourge of HIV that affects about 17 percent of the South African population. In fact, HIV can also be a risk factor for diabetes because antiretroviral drugs can cause glucose intolerance as a side effect. The adoption of the nutrient-poor American-style diet in urban South Africa now means that doctors and patients in the region must be aware of the potential link between HIV and diabetes. The South African public health community has starting taking steps to encourage healthier eating. Because sodium causes high blood pressure, and high blood pressure is a major risk factor for cardiovascular disease and stroke, the South African government capped the amount of salt that can be added to some processed foods sold in grocery stores. This legislation includes a 50 percent reduction of sodium in bread and comparable reductions in margarine, soups, and gravies. Public health professionals hope that with this measure, along with with help from industry, rates of high blood pressure will go down. “Help from industry” is a tricky concept though, as companies’ bottom lines often take precedence over public health or corporate social responsibility. According to Kelly Brownell of Duke University’s Sanford School of Public Policy, “The arresting reality is that companies must sell less food if the population is to lose weight, and this pits the fundamental purpose of the food industry against public health goals.” This is as true in South Africa as in the U.S. Here in the U.S., obesity rates are much higher among Blacks and Hispanics than among whites. Much has been written about the link between food access (or lack there of) and the entrenched racial inequality present in American cities like Detroit, as grocery stores have closed over the years and convenience stores become the de facto food sources. These trends are not unrelated to what is taking place elsewhere around the globe. However, in places like South Africa, where healthy indigenous diets remain fresh in many people’s minds, the question remains: Is it possible to leave one’s rural homes, make more money, and enjoy the benefits of urban life without adopting the diet-related illnesses that go with them? Let’s hope the South African government takes this question to heart. This post is part of an ongoing series focused on the way the Western diet is impacting the developing world. Previous posts include: Mexico: Public Health, Rising Obesity and the NAFTA Effect and The Little Emperor’s Burger.